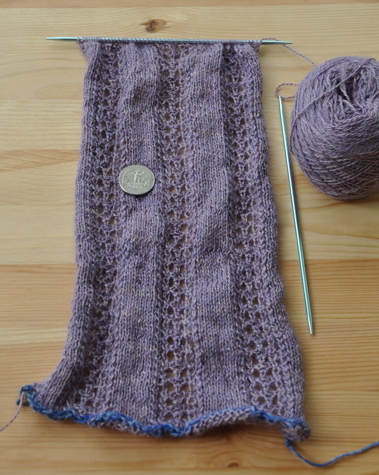 Thirty repeats in to the Flutter scarf from MimKnits and I have the lace pattern memorised. There are a hundred of these four-row repeats in total, fifty on each side so I have a long way to go at my current rate of three or four repeats per weekday. Looking forward to the next two charts and making the ruffle, because I’m getting really bored with this part. I might have to start something else to take the edge off. This is my first laceweight object and I like the light feel but my fingers feel odd after a long session. The yarn has subtle colour shading and I think it would look great with a matte silver (or aluminium) shawl pin. Flutter is intended for me but Irene already asked to borrow it when it’s done. Almost all knitting and spinning will cease in November for NaNoWriMo, it’s reserved as a treat after I get my words done for the day. I want to complete Flutter, and Heather’s Christmas socks, and my Eris cardigan. Heather loved the Fungus the Bogeyman socks I was working on over Fourth of July and asked for some of her own, which got me thinking. People that have seen a knitter at work and have some comprehension of what goes into a handknit may realise the time it takes to make stuff. People that appreciate handknits are more likely to take care of them, and not use them to wipe bird poop off the car, or stuff them in a closet, or toss them out. The first handknit gift to someone is always a risk. Will they like it, will they realise how much time and effort went into it, or will it be ignored, or dismissed as a "cheap" gift? It’s ironic people can think that, given even minimum wage for knitting time would cost a lot more than a store-bought approximation. I want the stuff I make to be appreciated, and I have a small list of people I would knit for again. A friend has been talking about wearing the socks I made her for weeks and I know she takes care of her handknits. She’ll probably get more someday. I knit on my lunch break at work, and using that time alone it takes a month to produce a pair of socks, which is a big investment of my time. My time is valuable, and I don’t want it wasted. That scarf’s really pretty! Amen to what you said about knitting for other people – my list is pretty short and restricted to those who will appreciate/take care of handknits. I have a short list of people who I love to give my handknits to as well – my brother’s girlfriend, my husband and girls, my Dad. Others, not so much – even my Mom who’s a knitter herself. I couln’t agree more that one has to pick recipients carefully because your work is valuable, and knits should only go to those who appreciate them!